How does Autumn affect bees? We’ve given you lots of updates on our bees throughout the summer, so we thought we’d fill you in on how our hived bees are kept throughout the Autumn. In short, we’re fattening them up for the winter. As our colony at Sacrewell was only introduced to the farm this year, it’s still quite small so doesn’t have enough reserves of its own to survive the colder weather. 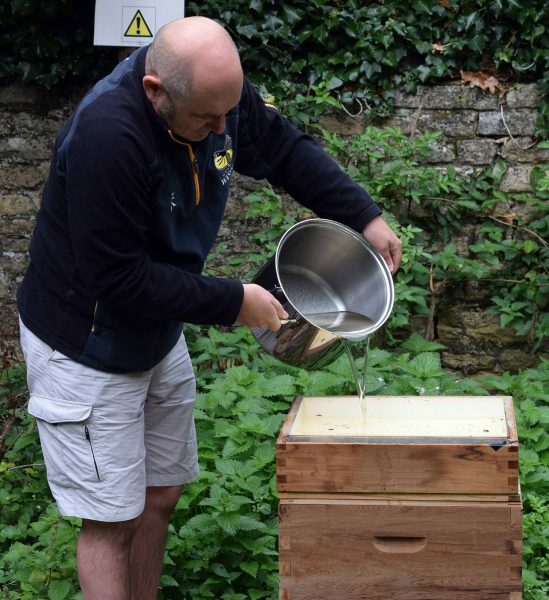 So to ensure they have enough stores to last them through the Autumn and Winter, our beekeeper, Kelvin Cherry, has been feeding them a special solution of sugared water to help them through. Learning and Interpretatuion Officer at Sacrewell, Nikki Cherry explains: “The supply of nectar for bees dries up throughout the Autumn and Winter and if the weather’s bad then they don’t fly, so we feed them to boost their stores. The colony will also be left whatever honey it made itself this summer.